Diabetes is complex. 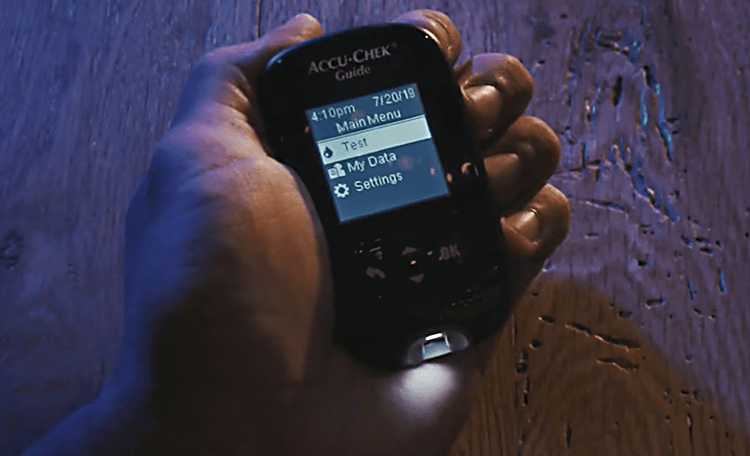 Checking your sugar doesn’t have to be with the Accu-Chek Guide system. 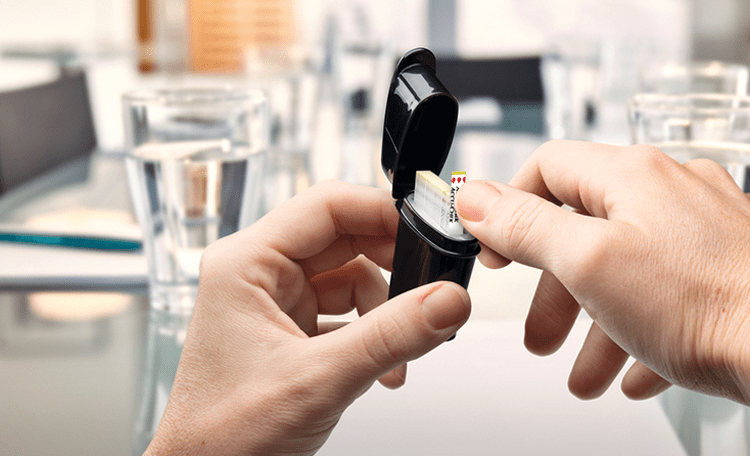 Spill-resistant SmartPack® vial lets you take one and spill none. Place a small drop of blood anywhere along the end instead of on a tiny spot. Strip port light for testing in daytime, nighttime or anytime. Always know the low price you’ll pay for strips with the Accu-Chek Guide SimplePay program. Give us your permission and always get the latest information from Roche Diabetes Care. Are you sure? You will receive a confirmation e-mail for this request, but you will not receive additional Accu-Chek product updates or special offers by email. 1 The Accu-Chek Guide SimplePay Home Delivery option is a monthly subscription. You are not eligible to participate in a subscription plan offered by Accu-Chek if you are enrolled in or have medical or prescription coverage through any government healthcare program, including but not limited to Medicare and Medicaid, or where otherwise prohibited by law. By choosing the Home Delivery option you are a subject to our full terms and conditions. Limit six 50-count strip vials per home delivery order. Subscriptions available in one-, two-, three- or six-month intervals. 2 THE PHARMACY PICK-UP CARD IS NOT INSURANCE; IT IS A CASH DISCOUNT PROGRAM AND CANNOT BE COMBINED WITH ANY FORM OF HEALTH INSURANCE. Those insured by any government healthcare program, such as Medicare, Medicaid, the military or VA, are NOT eligible for this offer. Insurers may offer a lower cost option. 30- or 90-day Accu-Chek Guide test strip prescription required. Limit 12 vials per refill. Refills cannot be dispensed before 75% of previous days’ supply have elapsed. Program may be changed or discontinued at any time. 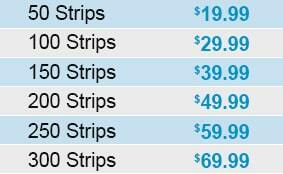 Discount varies based on quantity of test strips purchased. See card for details. 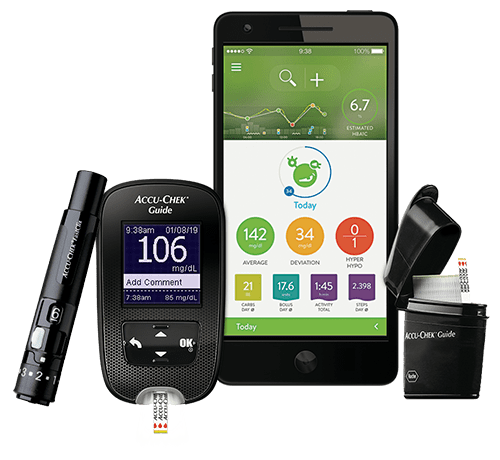 * Roche Diabetes Care, Inc., the maker of Accu-Chek products, communicates with customers to provide information on advances in diagnosis and healthcare, product innovations, and special offers. Roche does not provide your personal information to any third party without your permission, except Roche affiliates and business working on our behalf. You may always opt out of future marketing communications by calling 1-800-858-8072 or contacting us at accu-chek.care@roche.com. If you wish to unsubscribe from e-mail communications, you may also click the unsubscribe link in any e-mail you receive from us. ACCU-CHEK, ACCU-CHEK GUIDE, ACCU-CHEK GUIDE SIMPLEPAY and SMARTPACK are trademarks of Roche. Apple Wallet is a trademark of Apple Inc. Google Pay is a trademark of Google, Inc. Thanks! Use this card for a free meter. You can also use it for everyday savings on test strips. We're sorry—the program you're looking for is no longer available. Please visit the Accu-Chek Web site for current offers. We're sorry—the voucher number you've entered appears to have already been activated. Please click here to request another free meter voucher. We're sorry—there seems to have been an error processing your request. Please print the voucher below or try again using your mobile device. We've also sent your card by email, so you can print it later. Call your doctor for prescriptions for an Accu-Chek Guide meter and test strips. Or have your pharmacist call for you. 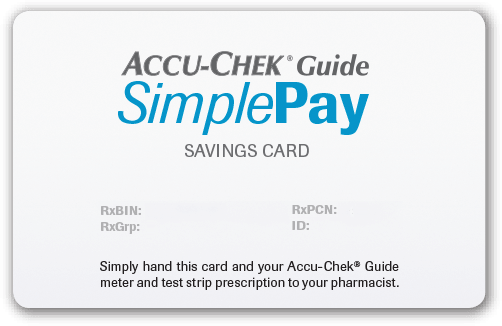 Bring the prescriptions to your pharmacist along with the Accu-Chek Guide SimplePay card. Pharmacist: Input Accu-Chek Guide SimplePay program as primary coverage only. Submit this claim to Argus using BIN 019158. A valid Other Coverage Code (e.g. 1) is required. For assistance with processing, contact the Argus Pharmacist Helpline at 1-844-373-0987.
available at all major pharmacies. 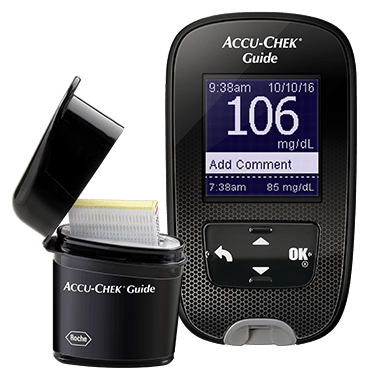 1 Accu-Chek Guide meter prescription required to receive one free meter every 24 months. By using this program, you certify that you will not seek reimbursement from any government healthcare program or private insurance for these offers, and understand and agree to comply with all program terms and conditions. Program may be changed or discontinued at any time. Only valid in the U.S. at participating pharmacies. ACCU-CHEK, ACCU-CHEK GUIDE and ACCU-CHEK GUIDE SIMPLEPAY are trademarks of Roche. Apple Wallet is a trademark of Apple Inc. Google Pay is a trademark of Google, Inc.
ACCU-CHEK, ACCU-CHEK GUIDE and ACCU-CHEK GUIDE SIMPLEPAY are trademarks of Roche. If you are insured by any government healthcare plan, you are not eligible to receive test strips through the Accu-Chek Guide SimplePay program. 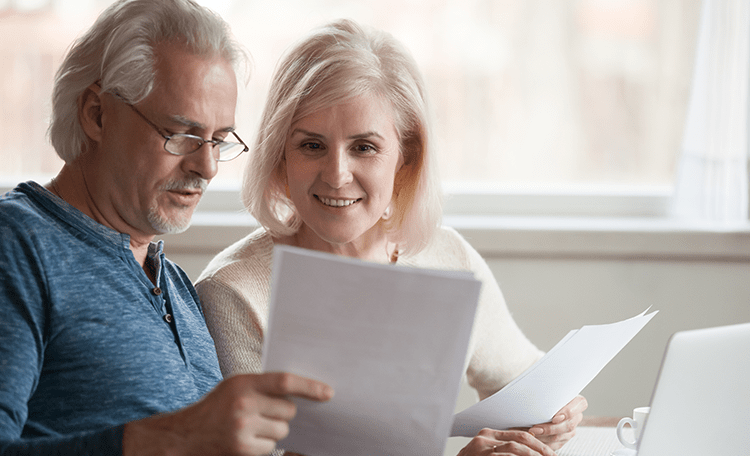 Fortunately, Accu-Chek products are always covered2 by Medicare Part B at the same low co-pay as all other brands.3 Learn more about Medicare Part B coverage. Accu-Chek products are also covered on many Medicare Advantage plans. Please contact your pharmacy or health plan to learn more about your benefits if you have another type of coverage. Present this voucher to your pharmacist along with prescriptions for an Accu-Chek Guide meter and test strips. We're sorry—the voucher number you've entered appears to have already been activated. Please visit the Accu-Chek guide site to request another free meter voucher. This information has been e-mailed to you, if you opted to receive e-mail communications from us. You'll also receive an Accu-Chek Alerts welcome text message shortly. Just reply "Yes" to confirm. Then we will send you a handy link for your free meter voucher. Pharmacist: Input voucher information for the free Accu-Chek Guide meter as primary coverage. By using this voucher, you certify that you have not submitted and will not submit a claim for reimbursement under any federal, state or other federally funded program, including but not limited to Medicare, Medicare Advantage, Medicaid, Medigap, VA, DOD or TRICARE. Pharmacist Helpline: 1-800-657-7613 (Monday‒Friday, 8:00 a.m.‒8:00 p.m. ET). 1 Free Meter Offer: Receive a free Accu-Chek Guide meter from a participating U.S. retail pharmacy with this voucher and a valid prescription for an Accu-Chek meter. By using this voucher, you certify that you understand and agree to comply with all program rules, regulations, and terms and conditions. Transaction information for this voucher identification number will be shared with Roche Diabetes Care, Inc. Roche Diabetes Care, Inc., has the right to rescind or amend this offer without notice. Limit one meter per person. It is not appropriate to seek reimbursement from any third-party payer—including Medicare, Medicaid, or other government healthcare programs—for free products. 2 Accu-Chek test strips are covered when medically necessary for the patient and prescribed by a physician. 3 Medicare. Medicare's national mail-order program for diabetes testing supplies. Available at: https://www.medicare.gov/what-medicare-covers/part-b/dme-diabetes-nation.... Accessed August 16, 2018. ACCU-CHEK and ACCU-CHEK GUIDE are trademarks of Roche. Apple Pay is a registered trademark of Apple Inc. Google Pay is a trademark of Google, Inc. Pharmacists: Input voucher information for the free Accu-Chek Guide meter as primary coverage. By using this voucher, you certify that you have not submitted and will not submit a claim for reimbursement under any federal, state or other federally funded program, including but not limited to Medicare, Medicare Advantage, Medicaid, Medigap, VA, DOD or TRICARE. Pharmacist Helpline: 1-800-657-7613 (Monday‒Friday, 8:00 a.m.‒8:00 p.m. ET). ACCU-CHEK and ACCU-CHEK GUIDE are trademarks of Roche.